If you’re someone that loves to mix songs, host karaoke nights or you’d just like to start learning how to do this, Virtual DJ Studio is a fun and friendly DJ console application that you can quickly learn how to use. 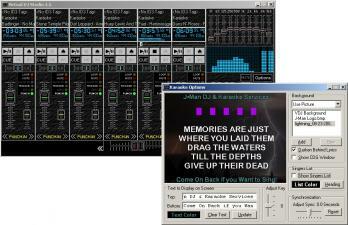 The program offers support for audio mixing, karaoke and playlists and you can even use multiple sound cards. It installs quickly and you are offered the option of installing additional karaoke backgrounds. While the interface might look overwhelming for a first time users, it’s actually pretty easy to learn especially compared to most similar tools. There are several mixers in which you can import tracks and play them simultaneously. MP3 and WAV audio formats are supported, but also other types of audio files. Each mixer comes with both standard and advanced audio controls including repeat mode, trigger and channel, volume, tempo, mute, and a customizable equalizer. You can use master volume, mute and automatic gain control to control all the songs at once. Virtual DJ Studio also lets you change the display options for file names, edit ID3 tags, use fading between tracks and enable zero pitch control. You can reset the settings or save your current stetup for later reuse. You can easily create a music database for karaoke events, but you can only use karaoke files for this task.